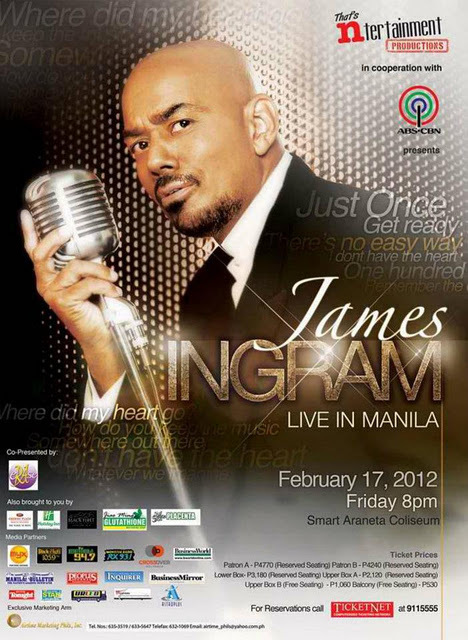 JAMES INGRAM Manila Concert Live is on February 17, 2012 at SMART Araneta Coliseum. Love Songs is not that late yet to celebrate Valentines Day. James Ingram made this songs Popular before and even now: "Just Once", and "I Don't Have The Heart". James Ingram Manila Concert Live Ticket Prices: PATRON A Ticket Price: Php 7,950 ; PATRON B Ticket Price: Php 5,830 ; LOWER BOX Ticket Price: Php 4,770 ; UPPER BOX A Ticket Price: Php 2,650 ; UPPER BOX B Ticket Price: Php 1,060 ; GENERAL ADMISSION Ticket Price: Php 530. James Ingram Manila Concert Live Tickets Outlets at all Ticketnet outlets. 0 comments: on "James Ingram Manila Concert Ticket Prices and Outlets February 17 2012"